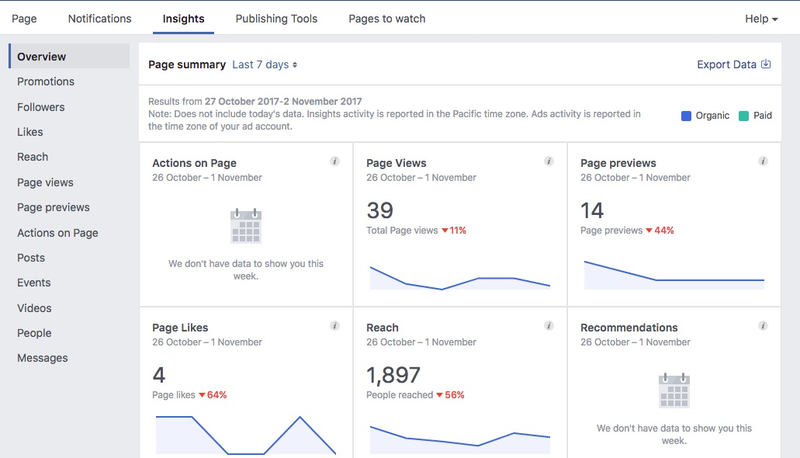 Why You Need to Audit Your Facebook Page – And Soon! “What’s the best way to make sure that my Facebook page is well-running and enticing?” you ask? Good question, because this is critical to retaining and increasing the visibility of your brand. The answer is by extracting the right data insights from the platform, of course! But not everybody knows how to get data from Facebook. And that’s where our Facebook Audit Report comes into play. A Facebook Audit Report consists of a summary of all the important aspects of your page’s statistics. It’s then followed by a list of action points that you can take to increase the overall awesomeness of your page. And there’s good news! You can follow along with the steps below to learn how to get data from Facebook and to create your own Facebook audit. 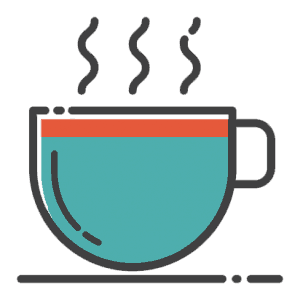 But even better: You also have the option to sit back and relax while our social media pros over at SEOintheSUN take care of it for you. Now, before we get started, we want to clear any unnecessary confusion about what we’re talking about. Are you new to the social media ecosystem? Here comes a little introduction to the key terms and tools that you’ll see in this guide. First, let’s get a few basic definitions down to be on the same page. Facebook Insights is the first stop when you want to learn how to get data from Facebook. It’s an inbuilt Facebook tool for those wanting to track user interactions with their Facebook fan page. 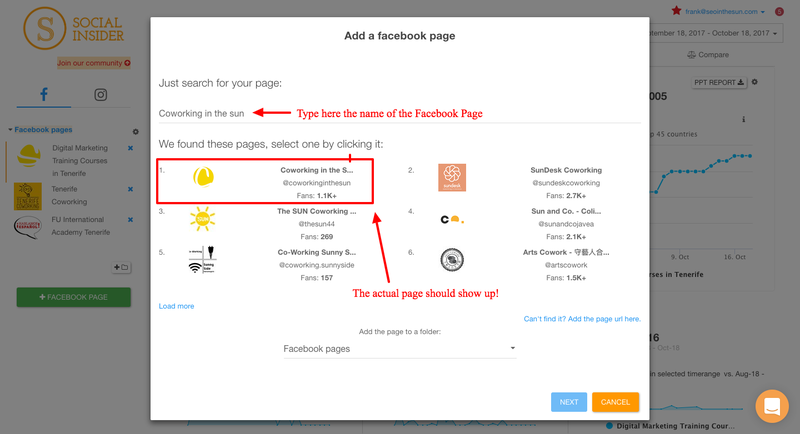 How to use Facebook Insights though, might not be intuitive for social media newcomers. Actually, it can only be seen by the page admin, so this person will have to give you access to their data by also adding you as an admin. There you will see a lot of valuable tracked data about the page’s performance and user actions. 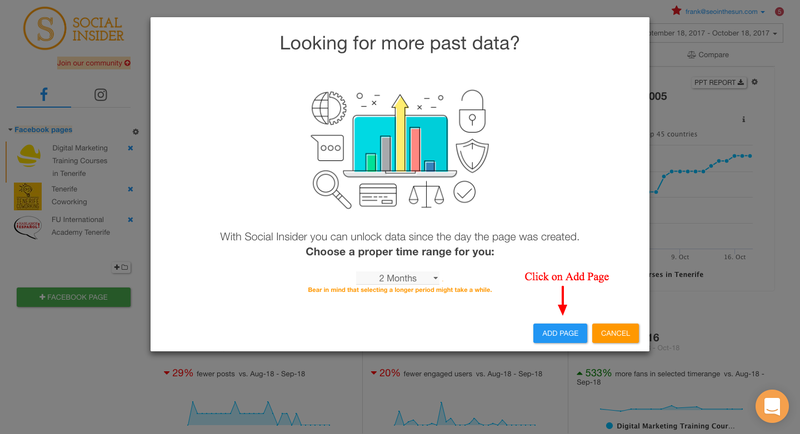 Social Insider is a tool that also helps you to track your page performance. It does not require you to be an admin of the Facebook fan page to access its data. 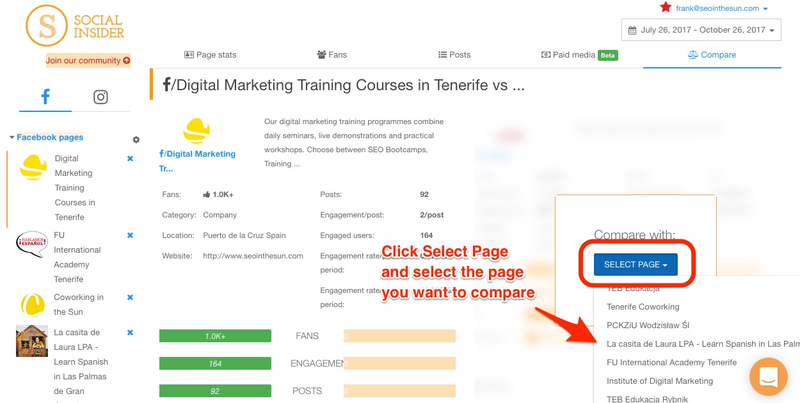 This way, it even allows you to compare your page performance against competitors. Your target audience is the group of people that a Facebook page is aimed at. It can be defined by several variants including age, gender, and location. It is important to be aware of who your target audience is. This way you can post appropriate content that they can relate to and want to engage with. This brings us to engagement. Engagement can include a range of actions that the target audience takes to interact with a Facebook fan page. This can include liking, sharing or commenting on a post. Engagement rate is an important measure of a fan page’s success. It can be determined by comparing the number of a post’s likes, shares, and comments to its overall views. It is also important to see how your competitors are managing their Facebook fan page. Analyzing what does and does not work for them can help your company to improve its own Facebook fan page. The Facebook audit score is an analysis of a Facebook fan page’s overall performance. A number of important statistics are gathered to determine whether the page can improve in these areas. Or not, if it’s already doing a good job. A page could be really good in one area such as having the current target audience liking their page. But their engagement rate could be really low and this will affect the overall audit score. We hope that we could clarify the social media lingo for you. So without any further ado: Let’s get this audit started! What are the necessary steps to complete a Facebook Audit Report? Step 1: Be clear on the basic information about your business! Step 2: Extract the right data from your and your competitors’ pages! Step 3: Analyze the data with our Facebook Audit Questionnaire! Step 4: Use your findings to come up with a personalized action plan! To sum it up, those are the different steps that we’ll take you through. Feel free to skip ahead at any time. Make Your Action Plan – Done!? Step 1: What info does your business represent on Facebook? This info helps you to create a profile for your Facebook page audit. Step 2: How to get data from Facebook for your audit? Alright! As soon as you are clear about all the background info on your business, it’s time to collect and analyze the data. … make sure to have all the answers about your business’s profile. 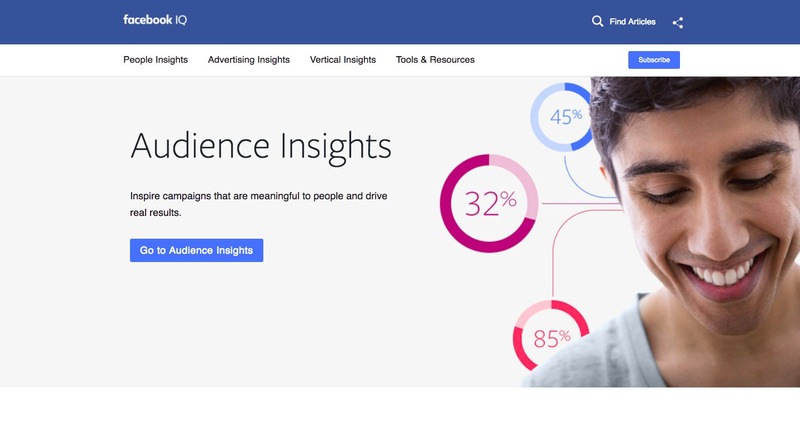 … access your Facebook Insights page. … set up an account with socialinsider.io. Keep in mind: Social Insider is a paid tool. But of course, it’s included in our service when you have our experts of SEOintheSUN take care of the audit for you! … add your Facebook account to Social Insider. … gain deep insights into your own Facebook performance data. … add your two main competitors to Social Insider. … compare your page to your competitors. To be able to extract data from Facebook Insights, you first need to access the tool via your Facebook page’s account. To do this, go to your page and on the top, you will see the Insights bar. Click on that and you’re in! Remember that this section can only be seen by the page admin! If this isn’t you, the right person first needs to grant you access to the data by also adding you as an admin as well. 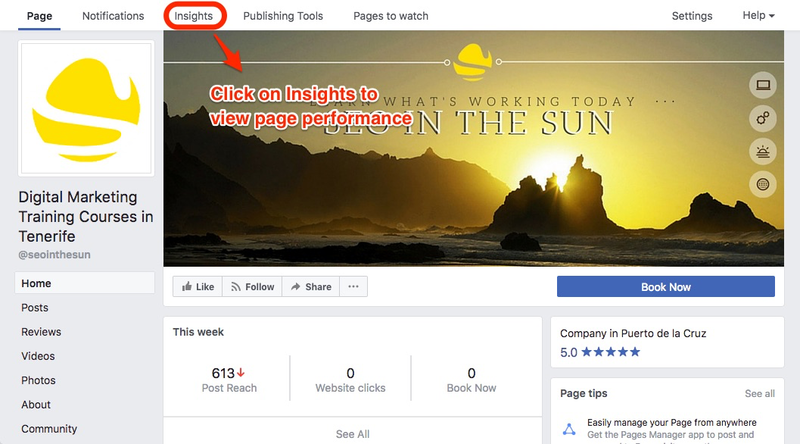 Do you want to gain more in-depth insights into your page and learn how to get data from Facebook pages of your competitors? Then we highly recommend signing up for Social Insider. This is a paid software that allows you to compare many metrics of your page against any competitor. We over here at SEOintheSUN are true Social Insider experts as we have been using the tool for many years. You aren't interested in purchasing a subscription to Social Insider? No problem! You still can analyze your performance through Facebook Insights and compare it manually to your rivals. 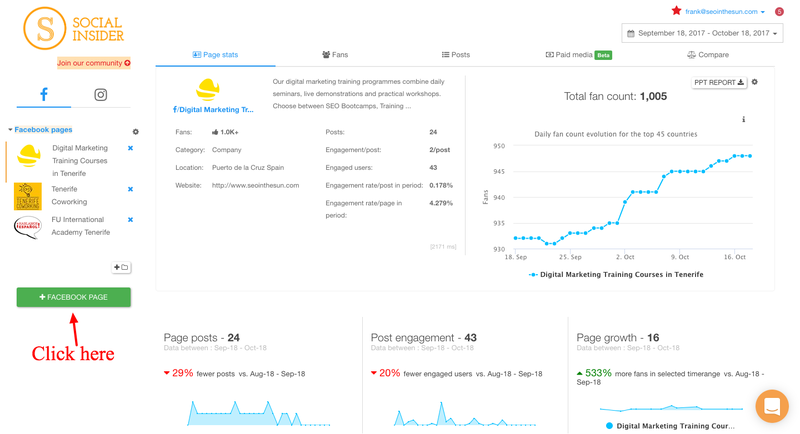 Just write down your own metrics and analyze your competitor’s pages by scrolling through their posts. Check their post frequency, the average engagement, page likes, etc. Sound’s too elaborate? Of course, we’ll also include a full breakdown of Social Insider’s findings in our Facebook Audit Report service. This way, you don’t need to purchase the software yourself. Do you want to continue this guide without Social Insider? Simply skip down to the next step and complete your very own Facebook Audit Questionnaire! For everybody with Social Insider access, keep on reading to understand how to use the tool. Once you login to Social Insider, press the green “+” button and add your Facebook page to your account. When the “add a Facebook page” box pops up, type in the name of the Facebook page that you want to analyze. Then select the correct page from the drop-down list. Click the blue Next button, select 6 months from the menu and finally click Add Page. On to the next element of Social Insider! Click the date range in the top right and then on the blue Custom Range button. Select the range of dates for the last 3 months from today and click the green Apply button. Now that you have your own insights collected, it’s easy to compare them to those of your competitors! To do this, click on Compare at the top right of the page and select your two competitors’ pages. 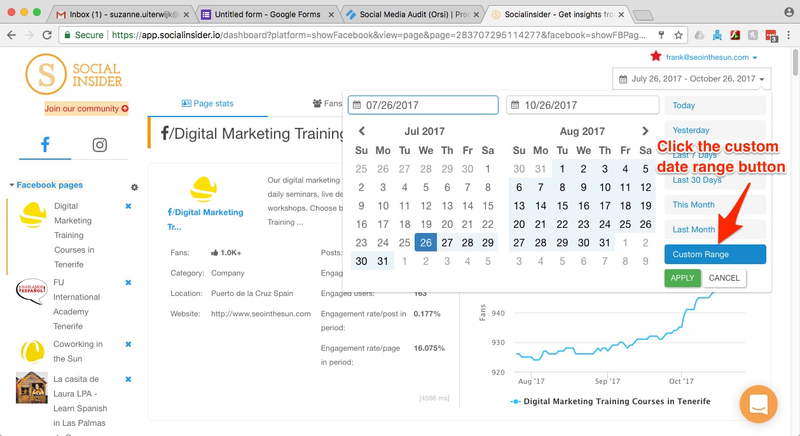 This setup will leave you with a nice side-by-side overview of your page performance compared to your competitors. Of course, we will make the same comparison for you in our Facebook Audit Report service. Step 3: How to analyze Facebook data? Now that you’ve fully understood how to get data from Facebook, it’s time to learn how to analyze it with our Facebook Audit Questionnaire. Answering a few questions about the current state of your page will help you to develop an action plan to improve it. Each question has a score and together they add up a maximum audit score of 100. After each question, keep track of your point total so that you can calculate the audit score in the end! If you can answer a question with “yes”, you get to collect the points. If your answer is “no”, your audit score won’t increase. In case a question doesn’t apply to you, add the points as well. 5 points: Is your company name used as the page’s title? 4 points: Is your website listed on your page’s profile? 4 points: Is your address listed on the profile (if applicable)? 4 points: Did you fill in the about section? 4 points: Did you upload an appropriate cover photo? 4 points: Did you choose to upload an appropriate profile photo? Does your page match the target audience criteria that you set yourself? 5 points: Does your most common fan age match your main target audience? 5 points: Does your most common gender match your main target audience? 5 points: Do your most common fan locations (i.e. countries) match your main target audience? 10 points: Has your rate of new fans increased by at least 10% compared to the previous 3 months? 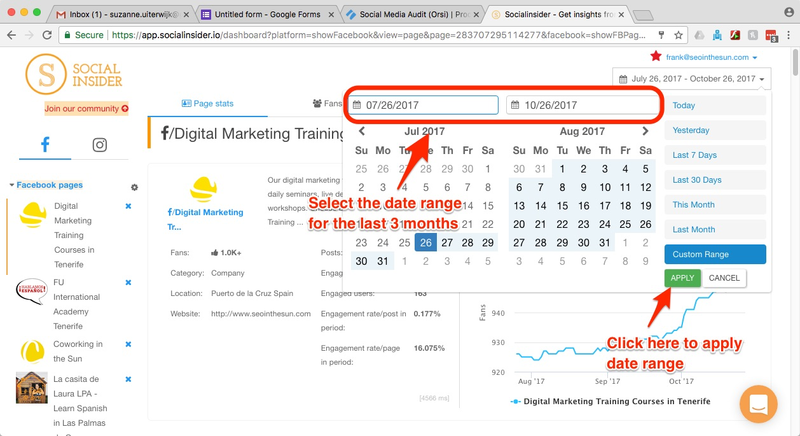 10 points: Has the engagement rate of your page improved by at least 20% compared to the previous 3 months? 10 points: Are you posting on your Facebook page at least 1 or 2 times per day? 10 points: Do you have a good variety of post types? Variety is the spice of life and this goes for Facebook pages as well! Be sure to keep things fresh by posting a wide array of different content. 5 points: Did you post more than competitor #1 but still remained under the “180 posts for the 3 month period” range? 5 points: Do you have a higher engagement rate per post than competitor #1? 5 points: Did you post more than competitor #2 but under the “180 posts for the 3 month period” range? 5 points: Do you have a higher engagement rate per post than competitor #2? Now the only thing left to do is calculate your score. Remember: The grand total is 100 and you only need to add up your points from the different categories. Whatever your score is, it basically shows how good your page performs in percentage according to industry best practices. Step 4: How to make a Facebook action plan? So far so good! You not only extracted your Facebook data but also analyzed it thoroughly with our audit questionnaire. Now it’s important to note the steps that you need to take to improve your page. This is called an action plan. Creating an optimized Facebook action plan is vital to the success of your Facebook page. And in fact, it’s not that difficult to reach a Facebook Audit Score of at least 80 if you put the following recommendations into practice. Here are the questions that you need to ask yourself. Can you further complete or improve your profile? Do you need to correct the audience that you are targeting? What steps can you take to increase your engagement rate? Should you be posting more or less each week? Do you need more variety in your posts? For you to be able to properly respond, we put together some answers to frequently asked questions. Go through each item and consider which exact steps to take to improve your own action plan. Is there any information missing from your Facebook profile? You want to engage but not overload your audience. So how should your post frequency look like? It’s best to post 5 to 10 times per week, or 1 to 2 times per day. Reshare or curate posts every other day. 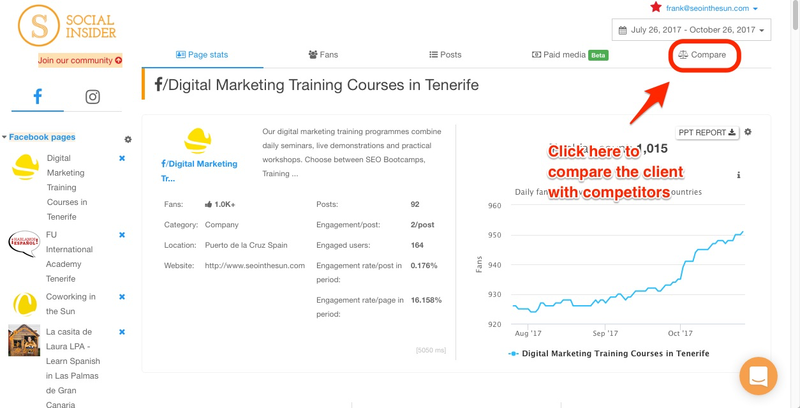 Compare your engagement rate to that of your competitors! Is your engagement lower? If so, your aim will be to increase your page’s rate above theirs. If engagement rate is below 1%, this is not a good sign and your content will need improving. Did you have a variety of posts in the past three months? Once you went through all items, make a list of your next steps and what you want to improve. This is your very own Facebook action plan. Conclusion: Your Foundation Is Ready! Congrats, it’s official! You did your own Facebook Audit Report! Now you know how to get data from Facebook and how to improve your own page to better compete. What are you waiting for? Completing the audit is really only the start. Of course, it’s great to thoroughly analyze the state and current performance of your Facebook page. With that, the hard part is done. So don’t stop now and make sure to put all these new insights to good use. It’s time to make the necessary changes to bring your page to the top! By the way, don’t hesitate to contact us and we’ll be more than happy to give you a helping hand with your entire Facebook Audit Report!